How to make headphones louder: Don’t you hate it? Your brand new headphones work like a charm, their sound mesmerizing your ears. You want to turn it up a notch, but then it happens’”the volume knob is already cranked up to the limit. Don’t worry, though. ou don’t have to be limited by your headphone’s poor volume forever. Here are our top tips on how to make headphones louder. This is what you’ve got to do if you use your headphones on a PC. First, plug them in and make sure the actual volume slider, button or knob on the headphones is turned up all the way. Next, adjust the volume within Windows or any other OS that you might have. If this still isn’t enough, there is a trick. On a Windows system, you can go into Control Panel, then select ‘Sounds and Audio Devices’. Next, go to the ‘Volume’ tab and fiddle a bit with the slider labeled ‘Device Volume’. If this still can’t get the volume as high as you want it to be, you can click on ‘Advanced’. There will be a new slider under ‘Play Control’; adjust this one and see if the volume rises accordingly and appropriate to your needs. You might need to repeat this for a separate setting called ‘Voice’ and / or ‘Voice playback’ depending on your OS and hardware. 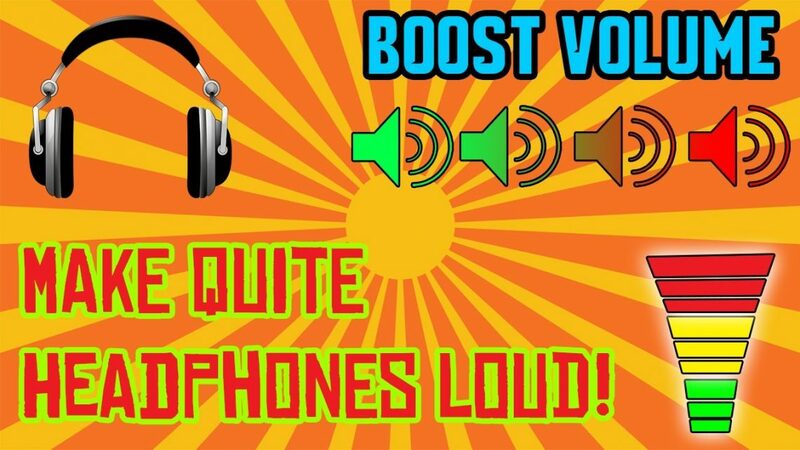 Though it may be somewhat ineffective based on just what combo of PC and headphones you’re using, this trick can come in very handy for when you just want to quickly turn up the volume without any fuss. On the other end of the spectrum, there are lots and lots of users who listen to music stored on their Smartphones or other portable devices as opposed to the PC. You might think that the headphones themselves are the main deciding factor when it comes to something like volume, but alas, the device they’re connected to is hugely important, as well. If you find yourself scratching the bottom of the loudness barrel when listening on your phone, try the following tricks. First, let’s try something mostly harmless. Go to your device settings, and under ‘Music’, you should find something along the lines of ‘Playback’ or ‘Audio Settings’ depending on your OS. Here, there should be a setting called ‘Volume Limit’. Turn it off. The built-in volume limit in embedded in most phones nowadays is supposed to prevent ear damage when listening via earbuds or in-ear headphones, but sometimes, it can just really get on your nerves by drastically throttling down the volume to unreasonable levels. Try adjusting your volume with the limiter off and see if it helps. If not, then there is something else to make those tunes even louder. There are a variety of apps out there, both for iOS, Android and even minor OSes like BlackberryOS, made just for this purpose: Increasing sound volume. Some popular ones would be SonicMax Pro for iOS or Volume Booster Pro for Android, but others are easy to find and download for free. These apps generally boost the audio up to your device’s absolute maximum sustainable volume, so there’s not much you can do if even those aren’t enough…can you? Actually, you can! It will involve a small investment, though. You see, you can amplify your mobile device’s aural power by connecting it to’”guess what’”an amplifier. Now, get that image out of your head. I know what you’re thinking: ‘I’m not gonna run around with one of those big, bulky amplifiers stuck to my phone! No you won’t. That’s why portable, smartphone-friendly headphone amps exist. They’re stylish, small, lightweight, sleek and would fit right into your usual portable audio setup. Also, they’re just about powerful enough to drive most headphones that connect to your mobile’s 3.5mm jack. These devices can usually be found in the double-digit price range, too, making them highly affordable. I won’t go into the technical details here, but an amp will quite literally push the sound you hear through your headphones beyond your device’s very limits, providing you with the loudest sound experience possible, period. If you still think your headphones lack a little volume after hooking them up to one of these, then, well, it might be time to pay your ENT specialist a visit. Do take note, though, when using some of these noise-enhancing methods. For example, amplifiers can push your device’s volume to levels that may be not only uncomfortable, but also dangerous, both for your headphones, any devices connected to them and, of course, if you really overdo it, your own hearing. But you don’t even have to use an amp to reach these dangerous levels. Some generous tweaking of your phone’s or your PC’s audio settings can already become really risky. Always use your own judgment, and don’t ramp up the settings beyond what seems reasonable. In the end, most of it’s up to you, both how far you want to take your sound, and what means you think are acceptable to get there. We’ve laid out all the cards for you, and it’s now time to start playing with them. Remember that nothing in this guide is compulsory. There is no step that you have to follow. If you don’t feel safe with doing something mentioned here, then don’t. And to all you others, have fun! Just, please, keep care of your ears, will you?